Cut off the top 1-2 inches of the artichoke (it's inedible) and the stem to create a flat base. Spread about 1 tbsp olive oil on a square of aluminum foil. Place artichoke on foil and spread leaves apart slightly with your fingers. Place garlic cloves or minced garlic between leaves as much as possible. Sprinkle top of artichoke with sea salt, a little bit of lemon juice and a drizzling of more olive oil. Cover completely with aluminum foil and place on a lipped baking sheet to catch any potential drippings. Bake for about 1 to 1 1/2 hours, depending on the size of the artichoke. Remove artichoke from oven and from foil. Using the pointed edges as your grasping point, scrape the meaty, flat edges of the leaves with your teeth. Keep pulling off leaves until you reach the heart. Using a fork, scrape the hairy top half of the heart off, exposing the meaty center. Spoon the meaty center out of the base and eat it. 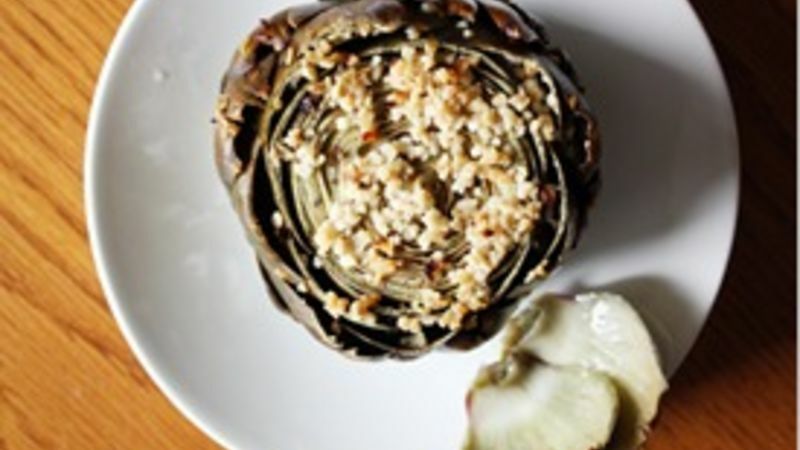 Artichoke recipes can be a little daunting—it’s not immediately obvious how to cut, prepare or cook this vegetable. Of all the methods we’ve tried, we think roasting it with garlic, lemon and sea salt is the best way to enjoy it straight up. And speaking of roasting, it’s our favorite way to prepare root vegetables, too.